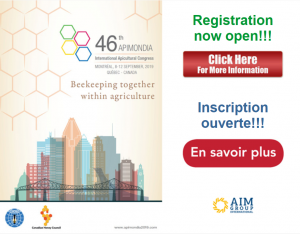 Montréal will be hosting the 46th Apimondia International Apicultural Congress in 2019. As many of you know, APIMONDIA is the International Federation of Beekeepers’ Associations. Its major objective is to facilitate the exchange of information and discussions by organizing Congresses and Symposia where beekeepers, scientists, honey-traders, agents for development, technicians and legislators meet to listen, discuss and learn from one another. Apimondia meetings are fabulous events that offer great opportunities to learn about all the aspects of the beekeeping world. During these meetings, from morning until late evening, participants explore various exhibits and learn about cutting edge research from all parts of the world.